After opening the campsite on Tuesday was a huge success in the last years, we will open early again this year. Therefore, the entrance corridors will already open on Tuesday at 10:00 and stay open until 22:00 in the evening. In the night from Tuesday to Wednesday it won’t be possible to access the campsite, but on Wednesday we will open at 10:00 again, this time all the way until Sunday. So all those who wish to arrive a day earlier for SUMMER BREEZE may do so during the 12-hour time window on Tuesday. However, we have to charge those arriving early a 10.- Euro contribution towards logistical costs per person just like last year, because it wouldn’t be fair that the significant additional costs (personnel, rent, etc.) are carried by all campers, but only those arriving early. In return, those arriving on Tuesday get the chance to camp near the infield (i.e. the entrance to the concert area). In addition, we will offer these early campers the free shuttle service to and from Dinkelsbühl on Tuesday already. This way, all those who normally had to rush to see the first bands as soon as they arrived will get a chance to use the extra day to visit the beautiful town of Dinkelsbühl. The exact timetable for the shuttle buses is not 100% set yet, but it will be made public in time before the festival start. 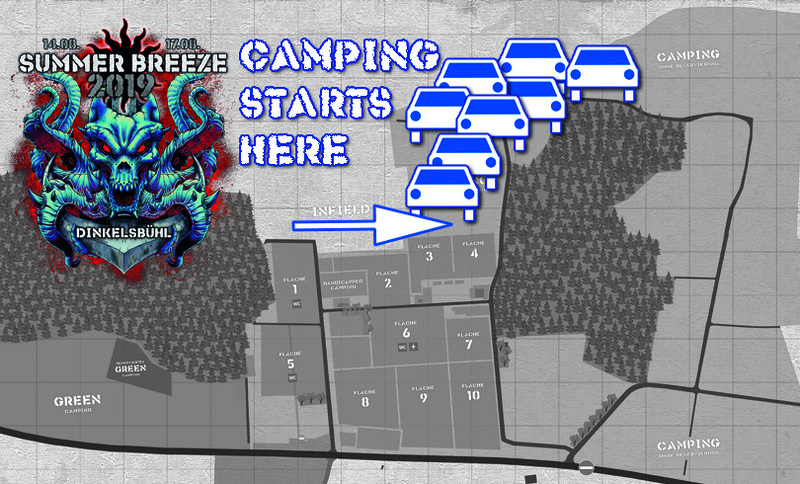 All those camping in the GREEN CAMPING area, on reserved camping space, in the disabled camping area and in the VIP campsite there will obviously also get the chance to arrive on Tuesday between 10:00 and 22:00 for the above mentioned fee. How do I have to book my arrival on Tuesday? I already have my ticket, do I have to book my Tuesday arrival separately? How do I pay the extra 10 Euros? The money has to be paid on site, there is no need to book anything. You just have to pay the 10 Euros when you pick up your bracelet. However, everybody has to pay, including people accompanying a handicapped person and VIPs.